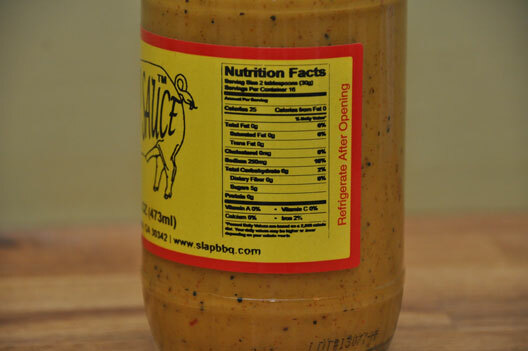 This sauce came to me from Atlanta, Georgia – a state not really known for a specific BBQ style, but for its close proximity to the major BBQ regions that lets it pick and choose freely from amongst their favorite BBQ styles. Popular places in Atlanta for BBQ include Heirloom Market that offers a Korean twist, Fox Bros BBQ that has excellent “sauce-free” pulled pork (rated #1 in Atlanta last year), and Swallow at the Hollow which minces pork instead of pulling it. 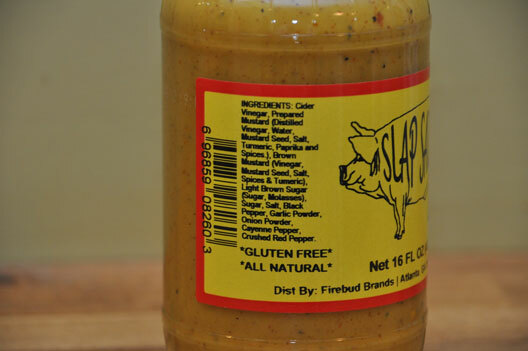 The Slap Sauce brings about a different image altogether, where you might just be tempted to “slap it” on your meat. 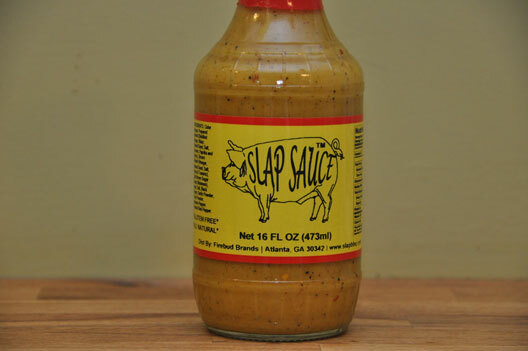 Sure, the name “Slap Sauce” is fun, but lacks description on the bottle. One suggestion might be call out the suggested use with a little tagline like “Slap It On Your Pork” which sounds a little risqué but it wouldn’t be a first (just take a look at some of the near X-rated competition BBQ team names). While this looks like a good sauce for pork and it is indeed be good on chicken, why not get specific and call it out specifically “Slap Sauce – The Best Sauce for Pork” – you will find making a bold claim like that may resonate with your customers. Slap it on yer pork! The label is professional, well-designed, and distinctive with its red / yellow / black color scheme and simple picture of a pig (which screams out PUT ME ON PORK). So next time you are shopping for sauce take the PORK SAUCE CHALLENGE – look around for a sauce that really identifies itself as a sauce your put on pig meat… they are hard to find. So if this is in my grocery store and I am cooking up some pulled pork, I can imagine my eyes would probably land on this one. Having a little tagline underneath the pig “The Best Sauce for Pork” would make that connection even stronger. The appearance and color of the sauce from outside the bottle looks quite enticing with lots of spices and specks floating around the bottle and you know I’m a huge fan of the specks. It makes it stand out from traditional yellow or Dijon mustard and appears to be made in smaller more homemade-like “batches” versus something that might be produced in gigantic vats. The bottle shape selected is a traditional 16 oz glass sauce bottle, which is sturdy and professional but not innovative. Inside the bottle you will find an equally well-put-together product. The ingredients are “all natural” which in this case means no high fructose corn syrup, no preservatives, no artificial colors, and nothing offensive. They also call out Gluten Free, which means at a minimum they are using ingredients which are not known to produce gluten reactions to folks with slight gluten sensitivities and celiac disease. One word to note here is that the FDA is starting to get more involved with folks making gluten-free claims of this sort, so all sauce vendors including Slap Sauce should be aware of that. 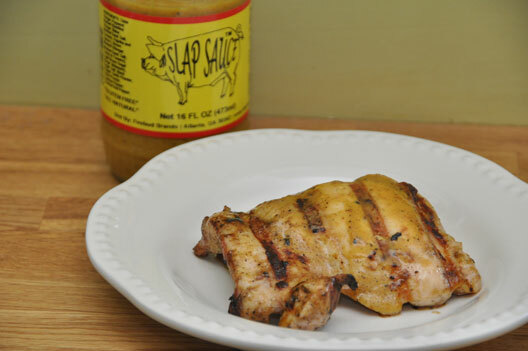 The Slap Sauce provides as excellent spicy mustard flavor for both dipping and cooking. The taste is a sweet, deep, complex mustard. It balances a traditional tangy mustard flavor with a sweeter mustard sauce flavor. When I say sweet, it’s not too far down the honey-mustard road (like the candy sweet stuff you put on warm pretzels in the mall) but a mix of prepared mustard, brown mustard, a dark brown sugar, and the spices that seem to go good on just about anything (salt, pepper, garlic powder, onion powder, cayenne pepper, crushed red pepper). So it’s a bit sweet, but not overly so. A bonus about most mustard based sauces is that you can usually slap on more of the sauce during cooking and apply sauce much more frequently compared to tomato-based sauces which are much higher in sugar. All in all, this is one of the best mustard based sauces I’ve tried which worked well on my chicken and would really make a pulled pork sing. Of course, after it has been slapped enough. Great review Brian! Looks like my kind of sauce!